Asparagus is our Day Two Think Spring surprise. 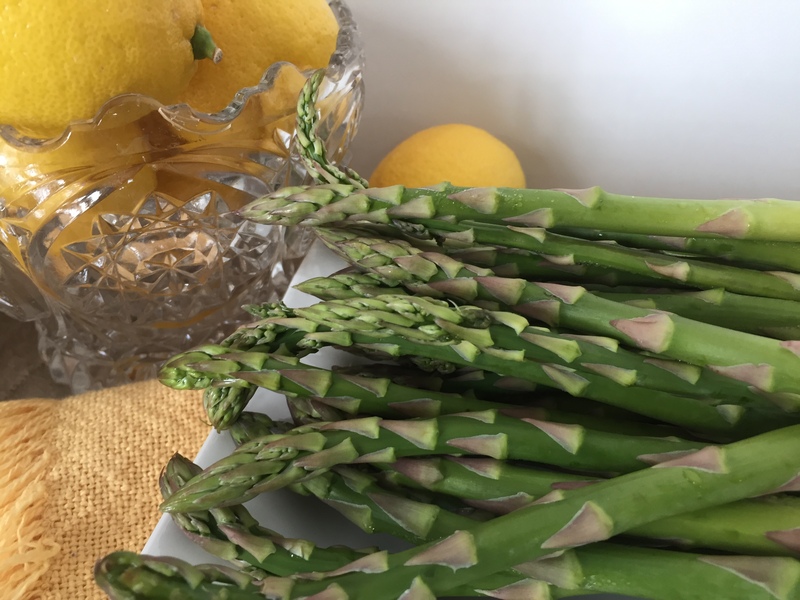 Asparagus is harvested in the spring and speaks springtime to me. It is always considered when planning our Easter dinner. I’m trying to bring something into our life each day for 5 days that evoke that springtime feel. It is definitely needed today as it is still snowing. Oh my! Asparagus grows wild in Wisconsin. You can find it where there is full sun, like in a ditch or at the side of a country road. If you are asparagus hunting, just make sure you aren’t trespassing on private land! I’m not sure the asparagus could even be found today with the amount of snow we have on the ground. This vegetable that is full of good-for-you vitamins can be roasted, grilled or steamed. I’m keeping it simple by steaming the stalks and drizzling butter over the beautiful veggie. I will top it off with zest from a lemon. Yummy for sure! Now days asparagus is available year around. For me it is still a springtime treat. I associate it with this time of the year. This is how I am bringing spring into my life today. It is still cold, gray, cloudy, snowy and on and on here in Wisconsin. The robins are even confused by this weather. I have to play a “mind game” to keep spring in my thoughts. I need my mood lifted to better my mental and emotional health. That in turn helps my body deal with my RA better. And that is using Arthritis Wisdom! Have a fabulous Day Two Think Spring! And take good care of yourself! 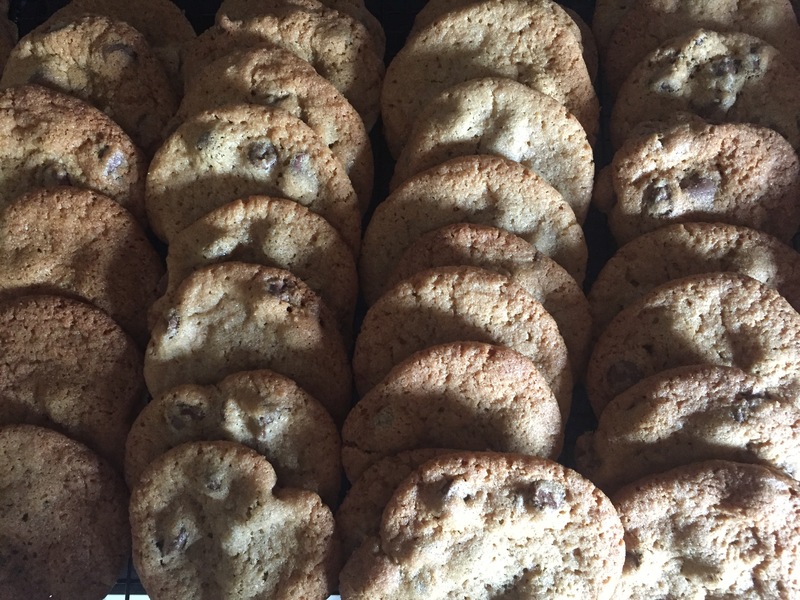 3 Welcome Home traditions have been changed to healthy options, but the one batch of chocolate chip cookies still shouts “So glad you are home”! I’ve changed 3 Welcome Home traditions to healthy options keeping with the management of my rheumatoid arthritis (RA). I may be the only one in the family with RA, but everything I do to help keep the inflammation under control is really good and beneficial for the whole family. Once our son lets me know he is coming for a visit, the planning and preparation fun begins. I like to spread the preparation out over several days. It is sweet anticipation! I will freshen his bedroom, plan meals and grocery shop. The meal planning and grocery shopping is where I’ve changed traditions the most. I’m becoming better at planning meals to include plenty of leftovers to minimize the need for snacks. That helps to limit preservatives, added sugar and added salt. I prepare everything fresh so I know what is in every part of the meal. It has taken me time to figure out favorite recipes everyone likes and the amount to make to allow for the desired leftovers. My goal this visit was to eliminate any pizza deliveries! If I had great options in the refrigerator, there would be no need to order out. It is tradition I have a pot of chili waiting at the time of arrival. I use the recipe from childhood, but now include organic mushrooms and green peppers for added variety of vegetables. I find myself trying for five different vegetables in my recipes, aiming to add flavor and nutrients without changing the dish so it has a trying-to-pack-more-nutrients-where-I-shouldn’t-pack-more-nutrients taste. As our son says, It must be edible! Chili is a great way to ensure leftovers for the next day. My family doesn’t tend to snack if I have satisfying meals for them. Also, they do not want dessert if I have satisfying meals for them. I was a dessert fanatic before I was diagnosed with RA, so I thought my whole family loved dessert. I also enjoyed baked goods to munch on and candies to grab and snack on. What a revelation I was the only one with the sweet tooth! So the only treat I bake is the one batch of chocolate chip cookies. The smell just shouts “Welcome home, we are so happy to see you”! I figure the warm-fuzzy feeling is a boost to our immune systems! A bowl of pistachios instead of a bowl of chocolates on the counter. Plenty of ice cold water bottles in the refrigerator instead of sport drinks. Mineral water with a splash of fruit juice instead of Mountain Dew. These are very small changes, but they make a big healthy difference. I would be refilling the chocolates often in the past. We would have cases of sports drinks and Mountain Dew in the extra refrigerator. By offering these 3 substitutes, no one even notices the missing sugar load. We go through a lot of bottled water, and that is a very good thing. I refill the pistachios for a few days and then when the bag of nuts is gone, I put the bowl away. It is interesting to me how our diet has changed without missing the unhealthy parts. It does take planning and preparation, but it is more satisfying. I’d say that is using Arthritis Wisdom! We would love to hear of healthy traditions you have implemented in the comments below! Alternate RA Activity or Expanding Activity Options? Me snowshoeing at Big Sky! It was a lot of fun. I am someone with rheumatoid arthritis (RA), so I am always assessing my activities to best stay moving, but doing so safely with my joint issues in mind. This ends up more an alternate-RA-activity-or-expanding- my-activity-options sort of deal. I first think it through to reason the safety of the activity and then I give it a try. My snowshoeing expedition was a perfect example. Skiing has been a family activity since our son was in grade school. He is now a grown man! It is something we can all share no matter what each of our skill levels are. The whole idea was to enjoy it together. Well, my skill level never really progressed. I am far more interested in the scenery than speed and technique. That doesn’t matter. It is all about doing it together. My RA diagnosis has complicated my desire to ski, especially places I’m not familiar with. 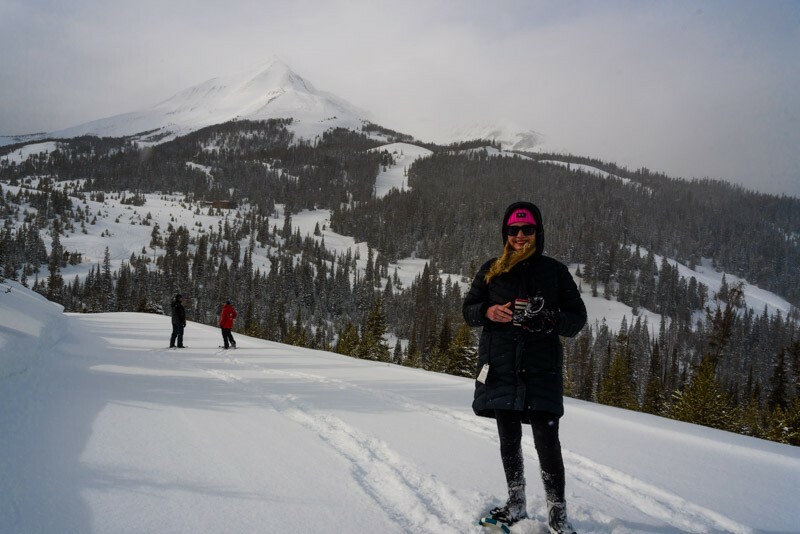 When we planned a trip to Big Sky, Montana, I decided not to ski, but I thought snowshoeing would be a reasonable alternative. Walking on snow sounded safer than skiing those big mountains! I did my due diligence and scoped out a group of newbie snowshoers guided by a professional in these matters. I then spoke with the representative from the company guiding the snowshoe hike to make sure I was clear on what it all entailed. At that point I was good to go. It sounded like a lot of fun and great exercise! I decided I could enjoy the beauty and wonderful snow by snowshoeing while the rest skied. I could still be engaged in the wintertime activities, but in a way respecting my RA situation. With nine people in the group we took a chairlift up to 8800 feet. We then hiked into the woods. The base was between 5 to 7 feet, so the trees we saw were actually the treetops! It was snowing big fluffy flakes and off the trail looked like a sparkly pillow. That was a good thing because it didn’t take long before I took my first fall. Snowshoeing gave me just the perfect amount of challenge. I had to use my cleats and use a little strategy where to step. We hiked some already created trails, some roads, and then the guide took us through woods that we created our own trail. At that point we were hiking through at least one foot of fluffy snow. We ended up hiking over 3 hours. I had hand and foot warmers in my gloves and boots and that kept me warm. We all fell multiple times, so we looked like snowmen at the end of the trail. It was at the very end of the hike that I was getting wet, so the end came at the right time! I’m thinking I have a new option for activity to keep me moving. I will not rule out skiing again. When we got off the chairlift I looked at the ski trails and believe I would’ve done just fine on them. Big Sky actually has a good number of easy trails. My RA has expanded my activity options. I’m trying things I probably wouldn’t have without my joint considerations. I’m calling that a win! I work hard at making my RA have the smallest footprint on my day-to-day life. In reality though, I am constantly making choices and decisions to best manage the disease. It is a bit second nature, therefore my RA really isn’t so in-my-face. It is just the way it is. And that is not a bad thing. Arthritis Wisdom would love to hear some of your alternate activities to accommodate RA. We can learn so much from each other. And that is a very good thing!